MEDFIELD, Mass. – It was the type of game that left spectators thinking it was a shame that either side had to lose. It was a game with wild swings of emotion and momentum. It had a coach with arms raised dancing down the sideline and it caused tears on both the winning and losing benches. Twice Foxboro had the game in its grasp and both times Medfield managed to stave off defeat. 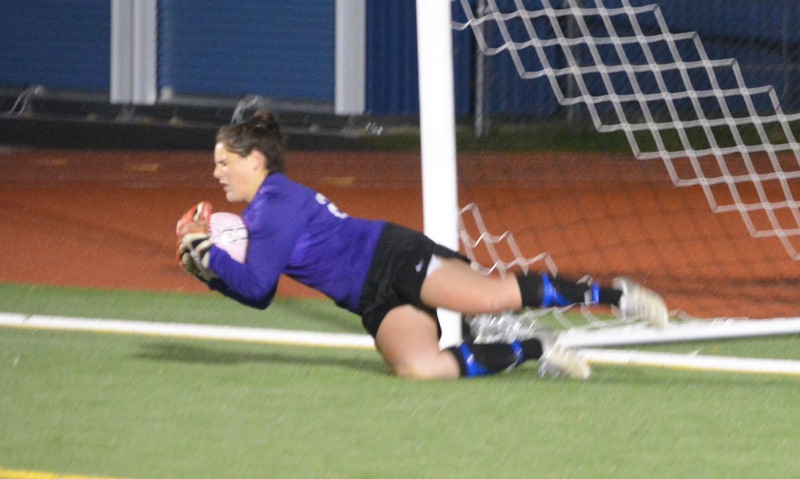 A headed goal with only four minutes remaining forced overtime and then backup goalie Emma Hilvert became the hero, saving a penalty to stay alive and then saving a second to get the win. For the third time in the past four seasons, Medfield knocked Foxboro out of the playoffs, winning 5-4 in a shootout following a breathless 2-2 draw Monday night at Calvin Fisher Field. Foxboro led 2-1 inside the final five minutes when Medfield earned a corner kick. The ball was played into the middle by junior Maggie McCarthy and Sophia Ouimette out-jumped the Foxboro defense to head home from close range. Medfield almost won it in the final seconds of regulation but Alanna Cooney shot it right at Foxboro keeper Hallie Canfield. The best chance of the first overtime fell to Foxboro senior Riley Collins, who got on the end of a cross by classmate Hailey Maling, but could not direct it on target. In the second overtime, Medfield had the chances for the golden goal winner, but Allison Petit saw her long-range effort land on top of the goal and Canfield came through with a clutch save, denying Cooney with a sliding block a few yards outside of the box as the Medfield forward raced onto a through ball. The game would be decided by penalty kicks. 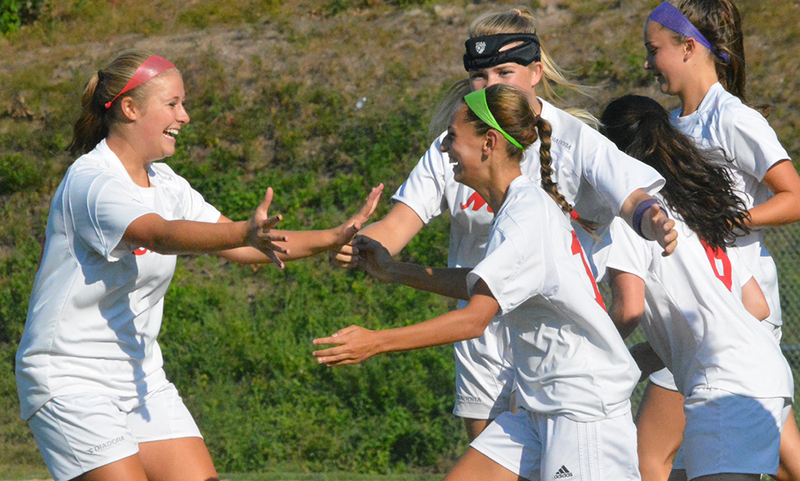 Both teams made each of the first three (Kristen Bortolotti, Lily Sykes, and Canfield scoring for Foxboro). On the fourth Medfield kick, Canfield got down well to her right to make the save and put Foxboro once again on the verge of the Div. 2 South semifinal. Jamie Gorham added the fourth kick for the visitors and that was matched by Medfield. Lauren Flahive had a shot at the win, but Hilvert used her full reach to tip the shot away. After Medfield added a fifth off the fingertips of Canfield and just inside the post, Hilvert again went full stretch to deny Collins to seal the win. Foxboro had started the game well, creating chances and denying Medfield time and space in the midfield and playing a high defensive line that caught star striker Taylor Sherman offsides several times in the first half. The partnership of Gorham and Flahive with help from Alexandra Stamatos on the left side managed to keep the hosts under wraps. Maling had Foxboro’s first chance with a looping shot that hit the crossbar and she provided a consistent outlet on the right wing running off center forwards Bortolotti and Olivia Dantona. On the opposite side was Collins and she had several chances, including a shot that was kicked aside at the back post after an angled cross by Sykes. Bortolotti opened the scoring in the 27th minute with a shot from 25 yards that took a bounce in front of the keeper and slipped through the five-hole for a fortuitous 1-0 lead. It would last until 10 minutes after the break when Sherman responded for Medfield, holding off two defenders before sliding a shot into the bottom corner. Seven minutes later, Sherman almost gave Medfield he lead with another run down the right channel but her powerful shot smacked off the post. Almost immediately back down the other end, Bortolotti ran at the Medfield back line and opened space for a drop off pass to Maling who hit it first time and curled it past the static keeper. The lead lasted 20 minutes, until Medfield’s late heroics snatched an equalizer. Despite the defeat, Lamothe-Vaughn was proud of the way her team finished the season against tough opponents like Notre Dame Academy and Medfield. FOXBORO, Mass. 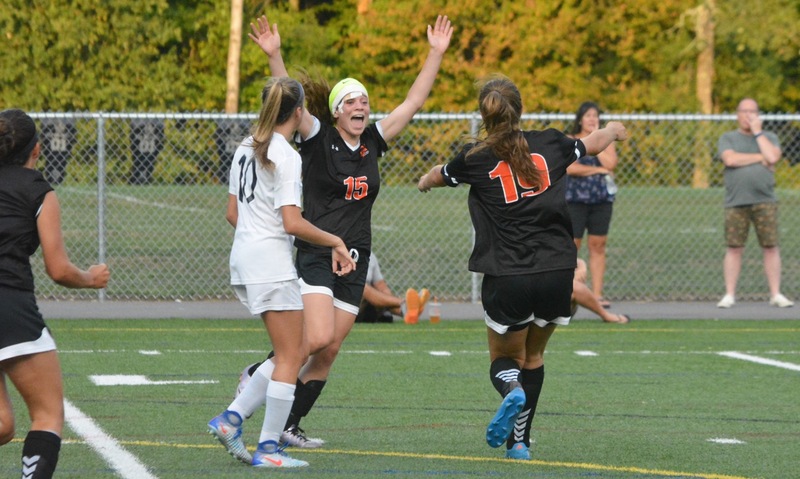 – Against Canton on Wednesday night, Mansfield coach Kevin Smith moved junior Hannah Reiter from center back to forward and the Hornets offense sprung into life for a frantic final 20 minutes at Gillette Stadium. On Friday afternoon at Sam Berns Community Field, Smith moved Reiter up front right from the start and once again Mansfield went on the attack. 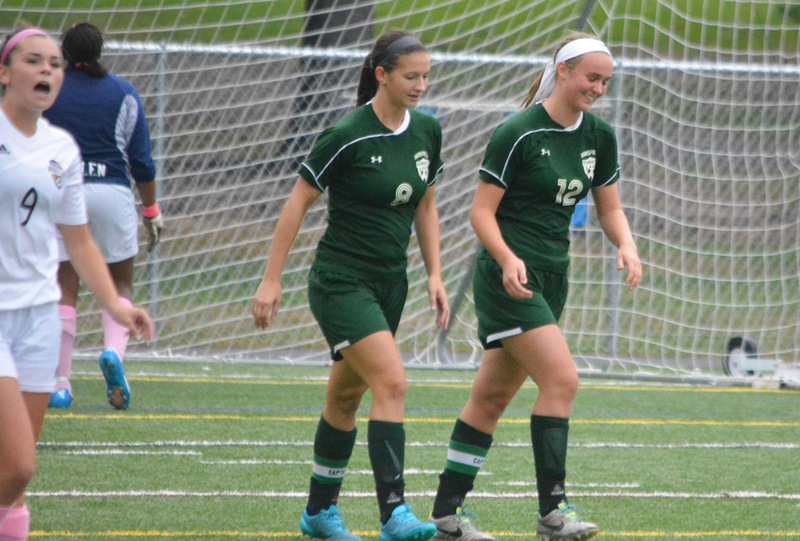 With Reiter in the middle of the front three, space was opened up on the counter for seniors Jen Kemp and Jackie Carchedi, who totaled all four goals for the Hornets in a 4-2 win over Foxboro that leaves Mansfield just one point shy of tournament qualification. It took Mansfield only 1:40 to get the lead when Reiter found space in the hole between midfield and defense and slipped a through ball to Kemp to spring a 2-on-1 with the last defender. Kemp laid the ball into the path of Carchedi and she made no mistake with a first time finish. Foxboro also created some dangerous situations coming forward with Hannah Burns forcing a save out of Emily Gaumond before Kemp hit the post on the other end. Burns would tie the game when she capitalized on hesitation in the Mansfield defense from a cross by Hailey Maling and pounced from close range. In the 23rd minute, Reiter should have given Mansfield the lead after good combination play between the front three but she sent her shot narrowly wide when clean through on goal. Three minutes later, Kemp teed up Carchedi for her second. Kemp worked space down the right channel and somehow kept the ball alive under pressure on the end line. She managed room for a low cross that picked out her classmate for a side-foot finish. Four minutes to halftime and the lead was extended. Senior Rebecca Bornstein ran onto a through ball by Kemp and tapped the ball past the onrushing keeper before being tripped. Kemp stepped up to put away the penalty and make it 3-1. Just four minutes after the break, Kemp got her second. The forward ran at the center of the Foxboro defense, cut to her left and fired a low angled shot past the keeper to make it 4-1. The game was not over for the Warriors, who kept the pressure on in the second half despite the deficit. Riley Collins provided a consistent outlet on the wing and she forced a save by Gaumond with a good run down the left. Carolyn Will also forced a save with a long, curling free kick. One struggle for Foxboro was the tight marking that Mansfield had on midfielder Lily Sykes. With Katie Bongarzone and Jill Savoie in close proximity at all times, Sykes had little time or space with the ball to try and create. The Hornets switched a number of players as the second half wore on and Bornstein, who had been starting games until the decision was made to move Reiter forward, was a constant menace down the right wing. Sykes would get Foxboro one closer with five minutes remaining. Rather than sending her free kick into the box, she went for goal and was able to beat Gaumond at the near post to make it 4-2. Mansfield (8-2-1, 7-2-1) will host Sharon on Tuesday, while Foxboro (5-4-0, 5-4-0) has a quick turnaround and plays at Walpole on Saturday night.